Structure My Deal tools are complete — you're ready to visit Dave Gill Chevrolet! Why Buy A Chevy Courtesy Car? Buying or leasing a new or pre-owned Chevrolet is an exciting experience, which is why our Chevy financing experts are here to make the process go as smoothly as possible. Even if you've struggled with getting approved for an auto loan in the past or don't think you can afford a monthly payment, our Chevy finance team is here to work with you to help you drive home in a reliable set of wheels. Our Chevrolet dealership in Columbus, OH, is dedicated to serving residents of Columbus and beyond and helping our customers accomplish their goal of owning or leasing a Chevy vehicle. At Dave Gill Chevrolet, our policies are simple. If you have a minimum income of $800 per month, we can guarantee you credit approval. Even if you have a poor credit score or other outstanding debts, our team is here to work with you and find a payment plan that you can be comfortable with. We'll set you up with a subprime auto loan that's affordable and accommodating to your budget. A new, used or Certified Pre-Owned Chevrolet can change your life, so don't miss out on this opportunity to upgrade your lifestyle with a new Chevy. If you're coming from Columbus or the surrounding metro area, our Chevrolet sales and finance experts are ready to help you. Browse our selection of Chevy Cruze sedans and Chevrolet Equinox SUVs, or see how you feel behind the wheel of a Chevy Silverado 1500. Whether you need to tackle the jobsite in something powerful or require a family-friendly crossover for after-school activities, you can rest assured that you'll find what you need at the right price at our Columbus Chevy dealership. You can get the financing process started at home by getting pre-approved for Chevrolet financing here. 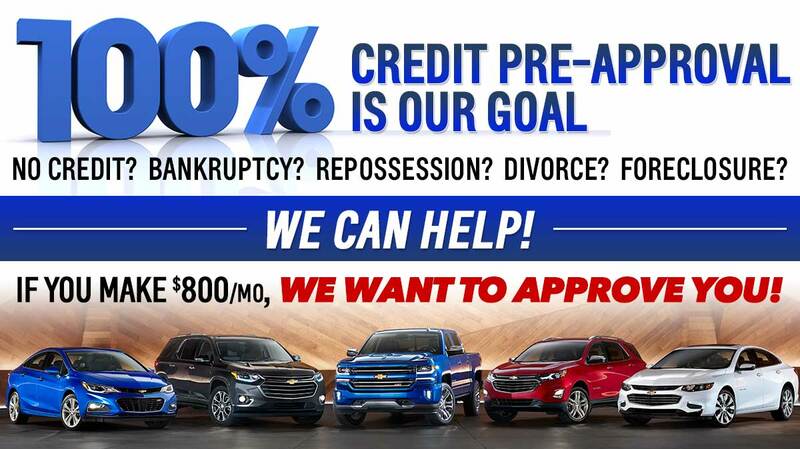 Don't stress about financing a Chevy -- our specialists work with over a dozen financial lenders to find you a reasonable rate and help you rebuild your credit. Stop by Dave Gill Chevrolet to learn more about our different Chevrolet loan and lease options today!